One of the perks of hiking through Scotland is that you’re able to forget about setting up your tent every now and then and get to sleep under a solid roof instead, for free! Travellers can make use of free shelters called bothies, provided they bring their own food and sleeping gear. With the majority being cared for by the Mountain Bothy Association, these unlocked shelters are maintained by volunteers or local estate management and funded by membership subsciptions and donations. In this overview I will list most of the bothies found along the Cape Wrath Trail, with a brief mention of on-site facilities (if any). The bothies are listed in order as encountered when following the Knoydart variant of the Cape Wrath Trail, from south to north. Let’s get started! In this guide I will only review the bothies I encountered on my version of the Cape Wrath Trail. There are more bothies to be found, as well as other ways to walk the CWT. If you wish to see a CWT bothy mentioned in this guide, please email me with details at info@beatthetrail.com! About: Often the first bothy hikers will encounter on the Cape Wrath Trail, Corryhully is a well-known bothy not maintained by the MBA but by the local estate. Features: Stone floors, crude wooden platforms to sleep on, one open fire hearth. One of the few bothies to have a working power grid! The nearby stream offers a good water source which should be safe to drink from (always filter when in doubt!). Plenty of wood around, take care to only gather fallen branches! Keep the bothy clean of your rubbish. Take any garbage with you! Be nice to other bothy guests. Make them feel welcome, at the very least. Contact the MBA about any accidental damage. Be careful when lighting a fire and always make sure the fire is out before leaving the bothy. If there’s no toilet, make sure to bury any waste well away from any water source and the bothy itself. Please do not use bothies for an extended stay of more than a few nights. About: Situated a little off the forest path, downhill, A’Chuil Bothy serves as a good place to end your day of walking. Features: Two rooms separated by an entry hallway. both rooms feature plenty of space on elevated wooden platforms. One open fire hearth per room. Well-maintained and plenty of firewood outside (once again, do not cut living wood!). Little fast-flowing stream outside offers a source of water. There are no livestock pastures upstream, this makes the water quite safe to drink. Stunning views of Loch Nevis. Sourlies Bothy can be seen on the far right. About: Small but famous for its atmosphere, Sourlies Bothy provides a cosy roof with amazing views. Features: One room with open fire hearth. Mussels can be found in the loch during low tide! Barely any wood to be found nearby. Only murky, salt water nearby, a source of good drinkable water can be found a little way back along the trail. About: This is a privately owned bothy, and the owner requires a small fee per person staying the night. This also means it is a very well kept accomodation! Features: Living room and two bedrooms with crude double bunk beds (no matresses). Running water and toilets! No fireplace. A view of the eastern slopes of Beinn Dronaig, with Loch Cruoshie and Maol-Bhuidhe Bothy below. About: An iconic location in a broad open expanse. Actually one of the most remote bothies maintained by the MBA. Features: Four rooms, two of which can be found upstairs. Each fitted with a wooden sleeping platform or camp bed. Open fire hearth. A good water source next to the bothy, although almost no wood. There is a small enclosure with young trees nearby, but it is best left alone. Bendronaig Bothy and the imposing open views all around. You’ll really feel like the last person on earth! About: Another privately owned bothy, it is nonetheless very accessible and free to stay at. It even features a toilet. Flush with the bucket! Features: Four rooms, each with its own little hearth. No sleeping platforms. Also a kitchen area, and a toilet with bucket flush. Usually well-stocked with firewood, there’s a wood pile outside. There is a fast-flowing water source right outside, but its quality can be dubious. A view of Loch an Laoigh. Bearnais Bothy is visible in the distance, on the far side of the loch. About: A small shelter located near Loch an Laoigh, Bearnais offered a good place to have my somewhat belated breakfast that day! Features: A single room with hallway, an open fire hearth and sleeping platforms. Good fresh water source nearby, no wood source. About: A tiny bothy, barely more than a shed. It makes for a cozy shelter though! Features: Good water source nearby, lots of wood around but no hearth in the bothy itself. A narrow bench might be used as a sleeping platform if you’re a tiny person or can lie very still while sleeping. Fancy a working holiday? Do you like travelling to remote locations, spending time in the Great Outdoors and being useful at the same time? The MBA can always use volunteers for work parties being sent out for maintainance! About: I never stayed at this bothy, but nevertheless added it to the list for the sake of total coverage! Features: An open fire hearth. Not accesible during stalking season (15th of Sept. – 20th of Oct.). As I haven’t visited this bothy myself, I can’t really give any more details on this. Contributions are welcome! About: A two-room bothy right along the trail. If you’re coming from Ullapool you can call it a day here or continue on for an hour or two to reach The Schoolhouse bothy, listed below. Features: Two rooms with a sleeping platform in one room and an open fire hearth in both. Almost no wood source nearby, water sources are of dubious quality due to the livestock in the area. The school-themed interior of the main room. Cosy! About: A neat, clean two-room bothy with a distinct school theme as a nod to the building’s history as a rural schoolhouse. Features: No fireplace, but well-insulated. Broad benches in one room that can be used as sleeping platforms. There’s a fast-flowing river nearby that provides a good water source. Scenic Glencoul bothy. Big, spooky abandoned house included! About: A bothy so nice I slept there twice! Well, two nights in a row, really. It features an adjacent abandoned house, for those of you that enjoy a little urban exploring. Just don’t disturb the ghosts. There’s also mussels to be had in the loch! Features: Two rooms, one with a fireplace and the other with a big sleeping platform. There’s not much firewood around, but a nearby fresh water stream provides a good water source. About: Only a few miles away from Glencoul bothy, Glendhu offers a great alternative. Located next to an inhabited house, it is very well kept and usually sufficiently stocked with firewood. Features: Two rooms with open fire hearth each and a large room upstairs. There’s a fast-flowing stream out back, I recommend you take water from it as far upstream as possible due to the livestock in the area. About: As these two bothies are really close to each other, they both offer a good point for shelter around Sandwood Bay. I never got to visit them myself, but included them for the sake of being totally inclusive! Features: Both feature a fireplace, though wood is very scarce in the area. Water sources are plenty. I haven’t checked the quality of the water myself, so use your own judgment on this one. Idyllic Kearvaig bothy, on its own private beach. About: The last bothy along the Cape Wrath Trail. Or the first, if you’re walking it north-to-south. Kearvaig is not only beautifully isolated on its own private beach, but it is also located in a military training area and therefore hard to reach at certain times. Check with locals before coming here to see if there are any exercises planned. Features: Two entrances, each leading to seperate parts of the building. This makes two bothies for the price of one! Both come with a fireplace. Water is best collected a way back along the path leading to the beach. Special mention: Kearvaig bothy is also home to the infamous Kearvaig Pipe Club, who recently found their spiritual home under a ‘no smoking’ ban. Being the good sports they are, they put some effort in creating additional rules so that no one should ever have to fear a fun night in a bothy ever again! The new and improved Kearvaig rulebook! That’s it! 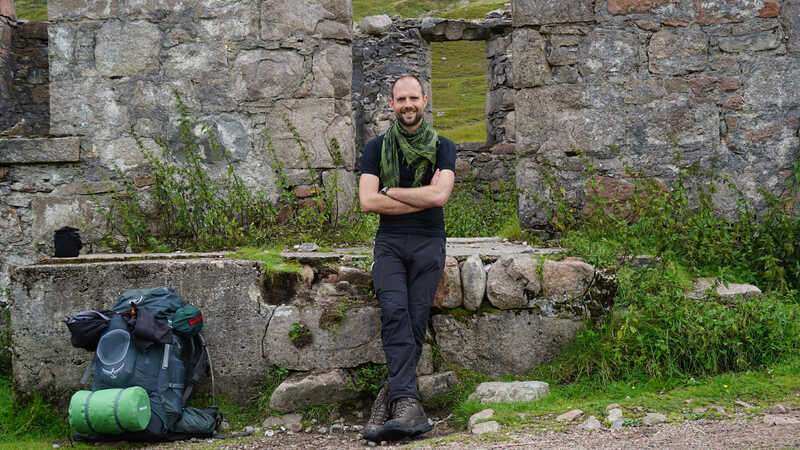 These are (most) of the bothies to be found along the Cape Wrath Trail. Want to know more? Visit the MBA’s website. They are always in need of donations and volunteers to help with the upkeep of Scotland’s bothies! For an excellent overview of bothies in Scotland, see the book The Scottish Bothy Bible by Geoff Allan. Thanks for the tips! I remember my first peat fire, I was lucky I shared the bothy with a peat veteran, or I still might be bumbling around with it, haha. Dear D. I understand this might be a sensitive issue, however I consider the mention a funny ending to this guide. I am in no way taking sides here; I merely portray my experiences as I experienced them. I have a great respect for the MBA and all that you do, but I also have to respect my readers and my own integrity and neutrality regarding this issue. Thanks for your special mention Roel, do not be perturbed by the dafty ducks comments, some people have uptightness permanently inserted up their bottoms. This bothy is open to anyone who wishes to put the effort in to get there in the first place. Smokers and non smokers. The up tight m o would like to think she owns the place and it is the m o who indeed says the KPC’s are not welcome. The KPC’ do no harm to any bothy, infact they, we, leave them in a better state than when we found them so bothy points should be awarded for there efforts. May I also add that the KPC’ are welcome to where ever they, we go because of this. Long live the KPC’.